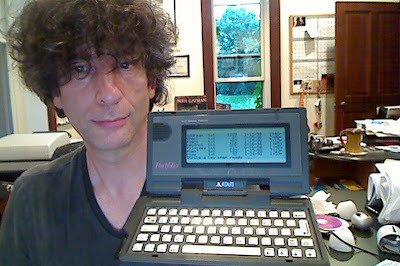 Neil Gaiman's Journal: Actually Quite Glad to be Gaiman. 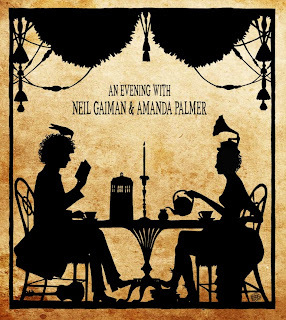 Actually Quite Glad to be Gaiman. I'm home. Got off the plane last night. Today was a dead day. The most exciting things I did were 1) have a long soaky bath - my first in many weeks, it's been showers all the way for over a month - and 2) not put shoes on. Looking for a card reader for my camera (I took lots of walking-the-dogs pictures, but can't get them off the camera tonight) I discovered my ancient Atari Portfolio notebook. 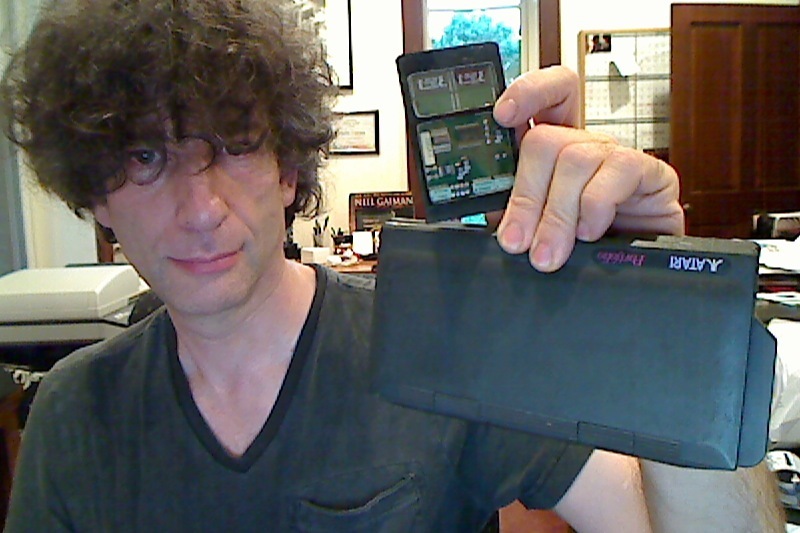 I put new batteries in and was amazed to discover that it worked - I can't have turned it on for about 14 years. And I thought about Moore's law. It has a handmade memory card I bought specially, filled with tiny text files. It's a 2 megabyte memory card, covered in warnings, which replaced the 256K card that came with the computer. I don't have anything that can read Portfolio cards any longer, although (I just checked) I pulled everything off it back in 1997, when I did have something that could read it. And the Portfolio made me think about this essay/speech by Ben Hammersley which I read last night, and am still pondering. So the Portfolio works perfectly, and I suppose that when/if I actually get around to giving my papers and stuff to a library, I'll put it in too. Still digesting the last six weeks. There was some really good stuff, and some hard real-life stuff too. I'll fill in a few of the gaps over the next few days - I'm waiting for some photos to come in. The last couple of days were exhausting - I travelled with Amanda and her band to Vienna and from there on to Amsterdam, mostly because I wanted to see Jonathan Carroll in Vienna. Amanda had warned it would be rough, and it was. I'm so glad I'm not a touring musician. But I'm happy I spent time with Jonathan Carroll. That was worth any amount of time in airports and sleeping sitting up on planes. Actually I got one of the most fun evenings in recent memory out of almost being a touring musician. 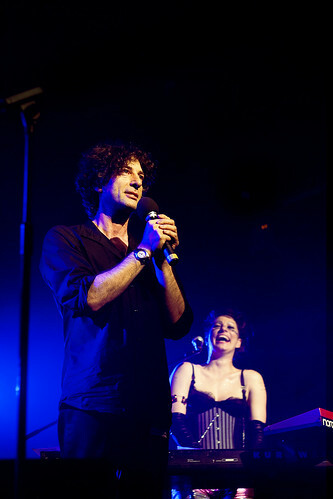 This is a photo of me singing "The Problem With Saints" at Amanda's gig at Heaven in London. I love it because of Amanda, laughing behind me, and because the whole evening was remarkable. Guests onstage included Tom Robinson (singing "Glad to be Gay" with a whole bunch of us onstage joining in on the chorus, while the 16 year old Neil Gaiman who bought the original "Glad to be Gay" EP in a Croydon record shop 35 years ago was being all thrilled inside me) and the amazing Tim Minchin. I don't know if you're familiar with The Guild. (If you're not, you could do worse than wander over to http://www.watchtheguild.com/ and start at Season 1). It's a story told in ten minute long webisodes. They're up to Season 5, Episode 7. 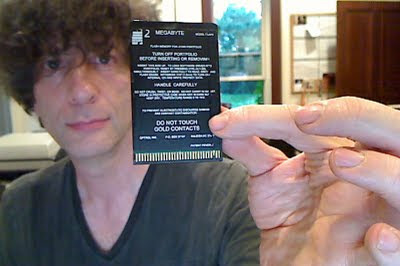 And the face on the video screen you click on is a bit of a giveaway as to who gets to play himself in it. Sometimes I wonder what would happen if the version of me I play in The Guild and the version of me I play in The Simpsons and the version of me I played in Arthur teamed up to fight crime and encourage people to read by hiding in their fast food. I actually am myself (and not playing anybody) in this, a mad, freewheeling conversation and interview from the Edinburgh Festival, where I get to answer all of Audrey Niffenegger's questions about fairytales and such. My old friend Tom Monteleone asked if I would provide his Borderlands Press with the insides of their 14th "Little" book -- in this case a little Gold Book. I've found lots of rare, unpublished and uncollected stuff. The book will be limited to 500 signed copies, and they are going fast. 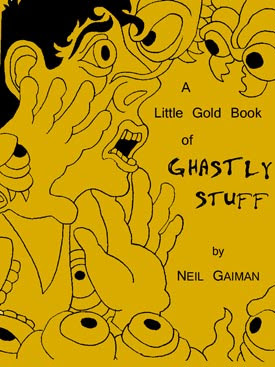 Gahan Wilson draws me surrounded by ghastly wondrous things on the cover. And I think I'll stop blogging here for tonight. There's a huge blogging backlog, of links and such, of photos and accounts of adventures that I want to put up, and a lot of questions and comments to reply to. I also have to say, as a business model, having people buy things ahead of time with Kickstarter is terrific. I like that almost half of the people who've supported it so far simply pre-bought the $1 download, and so far another 800 people of the 2,000 supporters want the CD. Right. Jet-lagged author stumbling to bed now. Good night.